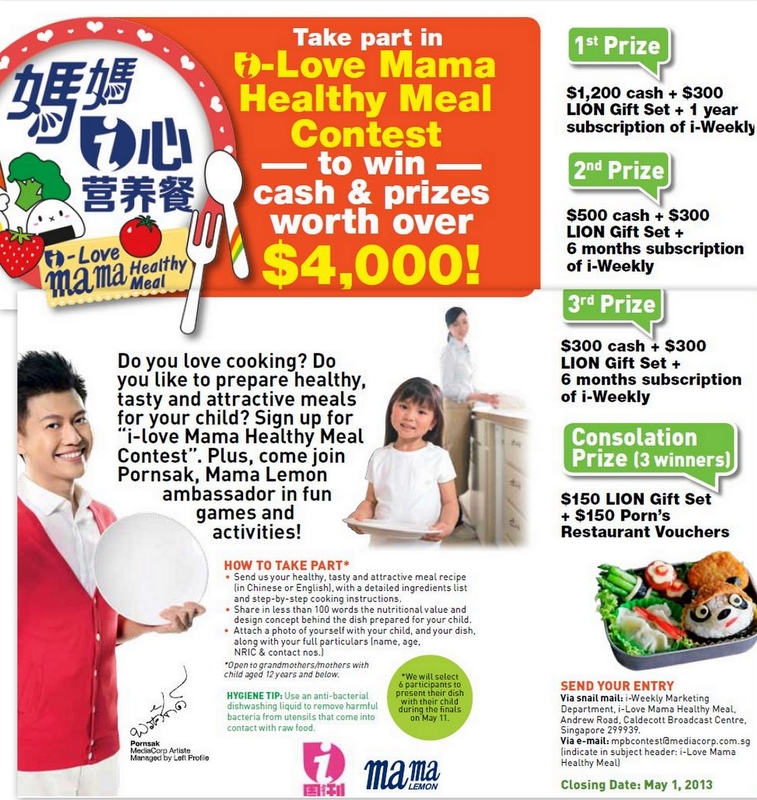 Finally after a few weeks of preparations (like designing and preparing of bentos for approval, practicing, lasing and etc) we managed to complete our two i-Love Mama Healthy Meal recruitment roadshows; 1st (Tampines Giant) and 2nd (Sheng Siong Supermarket) that were hosted by Mediacorp artiste Pornsak and Y.E.S 93.3FM deejay Siau Jia Hui! 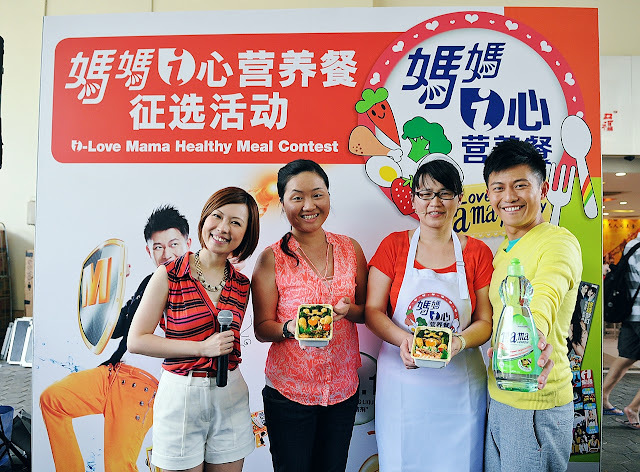 Although in between there were some hard times dealing with the coordination and etc but eventually we were all thankful that everything went on smooth and we did have fun to be in part of their i-Love Mama Healthy Meal recruitment roadshows. More photos of the roadshows could be found at our Facebook Page HERE. Introducing the ingredients used and concept of the Bento before the demonstration starts. Shiting (Lobsterpaint.com) and I busying at the i-Love Mama Healthy Meal bento demo roadshow. Samples of the i-Love Mama Bento made during the i-Love Mama Healthy Meal roadshow demo @ Sheng Siong Supermarket (88 Tanglin Halt Rd). 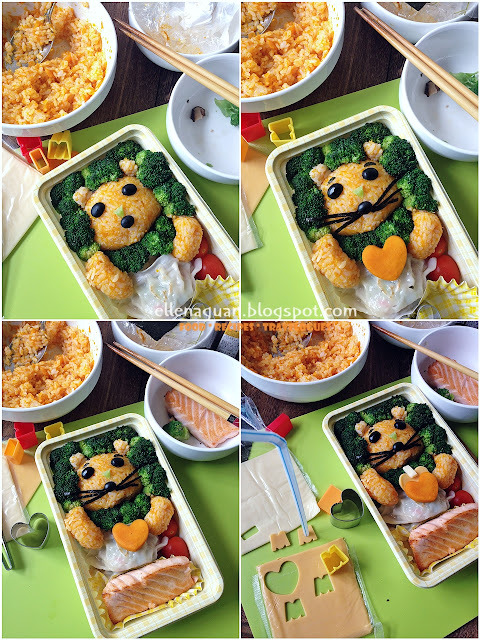 This i-Love Mama Bento design is request by organizer as they hope I would be able to include the Mama Lemon Lion Mascot as a character in the bento meal. Although at first I was quite hesitate to try out because I am not very confident to do character bento and also I am afraid that it might not resemble their Lion Mascot. 2. Spoon about 5 Tablespoons of cooked rice in a bowl, slowly mix in the mashed pumpkin until you achieve your desire colour. 3 Place 2 - 2.5 tablespoons of pumpkin rice on a piece of heat resistant cling wrap. Using hand, shape it tight into oval / round shape to form the lion head. Set Side. 4. Next using the same method as step 3, make 2 small oblong shapes using 1/2 tablespoon of pumpkin rice to make the arm of the lion. Set aside. 5. Arrange the cooked mushrooms (stir-fry the shittake mushroom with broccoli) at the top corner of the box before placing the broccoli around it (refer to the photo above) to make the outline of the lion head with the round/oval pumpkin rice in the middle. 6. Next place arrange the gyoza or wanton below the lion head to resemble the clothes. Place a few cherry tomato beside the goyza to secure the placement. 7. 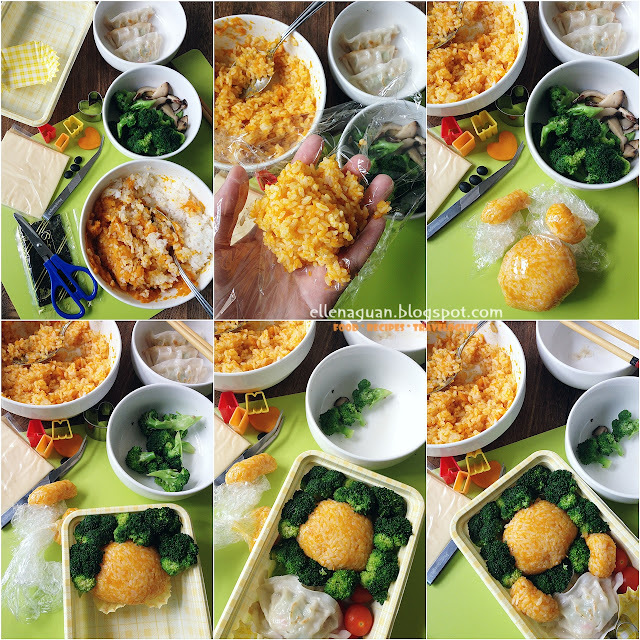 Shaped the two small oblong pumpkin rice ball to from the arm and place it below the head area. (refer to the photo above) Plus two tiny small rice balls for the ears above. 8. Using the black beans to form the eyes and mouth of the lion. Cut thin strips from the nori (seaweed) sheet to form the whiskers. 9. Arrange cooked salmon into the box and start adding in the "i-Love Mama" wordings using Alphabet, Heart-shape and drinking straw to cutout the shapes from sandwich cheese and punkin (heart shaped). 10. Above shows the close up look of the completed i-Love Mama Bento. 1. Marinate the salmon fillet with 2 tablespoons of freshly squeeze orange juice and rind of 1 orange together with some cooking wine and dash of pepper for 5 minutes. 2. Arrange some fresh corn kernels (optional) at the base of the baking dish, top with marinated salmon and some orange rinds. 3. Baked in preheated 180°C (degree Celsius) oven for about 10 minutes or till cooked through. Sprinkler some seaweed or bonito flakes on top and assemble into the bento box. 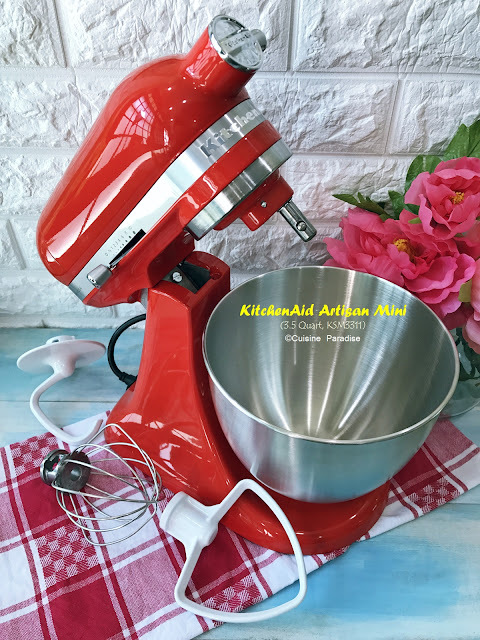 Lastly calling all mothers/grandmothers out there if you love to cook for your kids/grandchildren. Do consider to take part on this fun and family bonding i-Love Mama Healthy Bento contest which would be held on 11th May 2013. 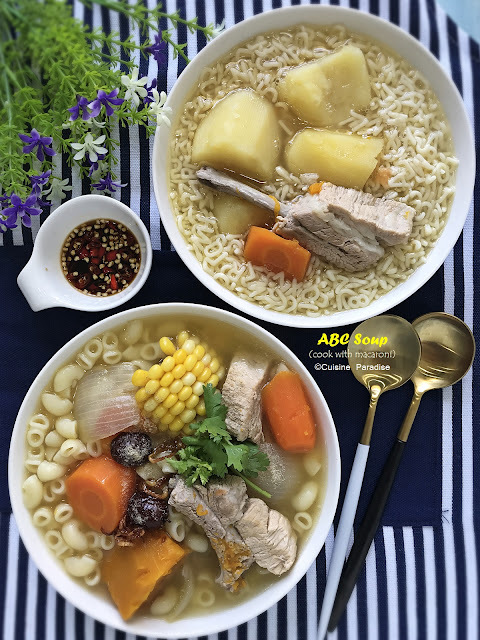 ~ Send in your healthy, tasty and attractive meal recipe (in Chinese or English), with a detailed ingredients list and step-by-step cooking instructions. ~ Share in less than 100 words the nutritional value and design concept behind the dish prepared for your child. *Open to grandmothers/mothers with child aged 12 years and below. Very nice and creative. Good job!